A court in Dubai has found a woman who lost her unborn child in a traffic accident guilty of manslaughter in what is said to be an unprecedented ruling. The Lebanese woman, who was nine months pregnant at the time, was also ordered to pay blood money. She said she had not caused the accident. The judge based the ruling on Islamic law. The court said the rights of unborn babies needed to be protected. Prosecutors had argued that the verdict should act as a deterrent. The accident happened in October last year. The court found that she had failed to keep a safe distance from the car ahead of her. Several cars were involved in the accident, English-language daily The National reports. The paper says the woman's vehicle was hit by the car following hers when she braked suddenly. The female foetus died after the umbilical cord was cut. 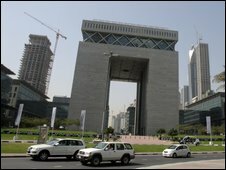 Dubai's traffic court ordered the bereaved mother to pay US$5,450 in blood money and fined her for "unintentional homicide". Salah Bu Farousha, head of traffic prosecution, said women in the third trimester of pregnancy should avoid driving altogether to protect their own and their foetuses' lives.